Smoothbores, you gotta love 'em, and it seems everyone does. My own experience with them began in the summer of 1997 when I bought my first, a 20 gauge/.62 caliber Carolina Smoothbore, from Jackie Brown. With minor exception, I have used no other gun for hunting since that time, and it has been a great pleasure. I've used many types of black powder guns in the last thirty years, and had some grand adventures with them all, but nothing quite measures up to the smoothbore. There are many things about the smoothbore type guns which I find appealing. High on the list is the style of some of the early guns, which fits right in with the time period which attracts most of my attention, that of the mid-18th century. In his book, __The Longhunter's Sketchbook__, Dr. James Hanson describes a gun in the collection of the National Park Service at Morristown, New Jersey which he calls a "Kentucky fowler". It matches my gun almost exactly. 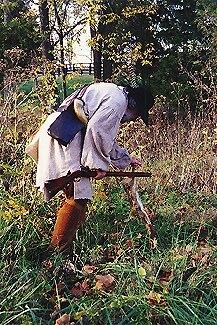 The style is of the early Virginia rifle, flintlock, stocked in tiger stripe maple, and is from about 1775. Like many of the guns of that period, mine has a long barrel, forty-six inches, and is cylinder bore. 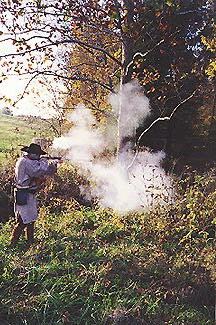 Nothing impresses me more about flintlock smoothbores, though, than their versatility. They are truly a "gun for all seasons". All the species which I normally hunt are fair game for the gun, and I have taken several species of both large and small game with mine. It matters not whether the quarry calls for a well placed ball out near a hundred yards or a charge of shot thrown in haste at a darting bunny, the gun can do the job, and very well. I can never decide which I enjoy more, shooting ball or shot. It has been great fun and very educational working up loads for both types of shooting. Being a muzzle loader makes it easy to custom load each and every shot, of course, depending on the situation at hand. The first round ball I ever shot from a smoothbore was actually done with a double barrel side-by-side flintlock shotgun, a twenty gauge. That was quite a few years ago, about 1990. That was long before the current craze of smoothbore shooting had come about, and getting information about round ball loads for one was essentially impossible. I had never shot a round ball from a shotgun, knew no one who had, and could find nothing written about it. I had to just make it up as I went along. I don't know why, but when I began to develope a round ball load for the gun, I thought of it as a shotgun, not a rifle, and loaded it accordingly. I put down powder, then a hard card overpowder wad and a half-inch cushion wad, then a patched round ball. For many years before that, I had shot nothing but black powder rifles, and it was my custom to load a ball which was .005 inch smaller than the bore diameter of the rifle. With a patch of about .015-.017 inch thick, most all my rifles would load easily and shoot very accurately. I naturally tried that combination in the shotgun, but it would not work, at all. In a rifle, especially one with deep, cut rifling, there is a lot of room for a patch to be crammed into. With the smooth barrel of the shotgun, there was nowhere for any excess patch to go, so I had to use a much smaller ball, one .020 inch smaller than the bore. That translated to a ball of .600 inch for the .620 inch twenty gauge. That has been my standard ball for all these years, in every 20 gauge I've ever shot. Using that setup, I was able to shoot some very good groups with the double, on the order of 1.5 inches at 25 yards and 4 inches at 50. When the thought finally occurred to me that I might be able to load the gun like a rifle, with just a patched round ball over the powder, no wads, I tried it out, but didn't get results nearly so good, so I've stuck with that original loading method for all these years. Never quit a winning combination. That double flinter had only a bead front sight on the rib, no rear sight, and I never felt the need for one. I feel the same about the smoothbore, which has a fairly high blade front sight, only. That required a different sight picture than I had always used for a rifle, of course, but it works, and works very well. I've always been very interested in learning the skills used by our forefathers, and I think that's the way they shot, so it's what I do, too. I hear a lot of people complaining about that lack of a rear sight, and I hear a lot of rationalizing as to why they put one on their guns, but I'm not convinced it's historically correct. I have taken five deer in the last four seasons with the gun, at ranges from fifteen feet to sixty-five yards, and have never felt the need for a rear sight. From a rest, I've shot groups as small as three and a half inches at seventy five yards, and that will get the job done for deer, every time. Just a few days ago, my hunting buddy and I were doing some informal shooting, and we both hit targets of four to six inches, offhand at sixty-five yards a high percentage of our shots, and that will also get the job done. Who needs a rear sight? Fouling is more of a problem in a smoothbore than in a rifle, in my experience. In the same way there is no space for a tight patch to hide in, there is no room for much fouling, so I've learned to do a few things to combat this problem. First, I always shoot FFFg Goex powder, which is cleaner burning. Yes, I know that is contrary to the conventional wisdom, but I've been doing it for many years without a single problem. Second, my cushion wads, which are the paper felt ones from Circle Fly, are always soaked with lubricant. The lubricant is usually just plain lard or solid Crisco, and I simply melt it and put the wads in until they are covered. I then take them out and drain them on paper until cool, then press on them with a folded paper towel to squeeze out the excess grease. These are carried in a small tin in my pouch, and they allow me to shoot essentially all day without cleaning in any way. That is of little importance in most hunting situations, but is a real boon on a busy dove shoot. When it comes to loading the ball, I shoot two different combinations. For most hunting, and for those times when I need best accuracy, I load a ball patched with a well greased (beeswax/lard) ticking patch .017 inch thick. For casual shooting, I usually load a bare ball followed by a thin overshot card wad. This needs to be done carefully. I ram the overpowder card wad, then press the cushion wad into the muzzle until it is just below the crown by a fraction of an inch. I then position the ball, sprue down, in the center of the wad and ram them both down, being careful to keep everything lined up straight. This is followed with the overshot card. I've shot this last combination enough to know it will give me almost as good accuracy, most of the time, and it's simpler and quicker to load. The offhand shooting I mentioned above was done using this loading, and I was impressed with the accuracy. So, my load for all round ball shooting is 80 grains of FFFg Goex, a .125 inch hard card overpowder wad, a .500 inch cushion wad soaked in lubricant, and then the ball, either patched with .017 inch ticking or loaded bare and followed with a .0625 inch overshot card wad. That loading gives me 1475 fps at the muzzle and an easy trajectory to work with in the hunting field...one inch high at twenty-five yards, two inches high at fifty yards, on target at seventy-five yards and about four inches low at one hundred yards. This method works well enough for me that I have no inclination to change it. In the field after small game, using the gun as a shotgun, I vary my loads according to the need, but generally stick to some standard ones under average conditions. As with the loads for round ball, I shoot only FFFg Goex for shot loads. Reduced fouling is a good enough reason to do this, but I also feel the quicker ignition helps me score a little better when wing shooting. I actually think the cylinder bore is an advantage in the small game field, and that many modern shotgunners take to the field with a gun which shoots too close. That depends somewhat on your own style of shooting, but I work up close, and it works for me. Distances from twenty to thirty-five yards seem ideal, and most of my shooting falls within that range. Except for the change from round ball to shot, my small game loads are built exactly like those for the round ball, using the same wads, lubricants, etc. For hunting rabbits, I find that 60 grains of FFFg and an equal volume of #6 shot (7/8 oz.) usually does a good job. I've rolled rabbits cleanly out to 35 yards with this load, yet it's not too heavy for those close shots in heavy cover. The same load works for squirrels, but I will frequently increase the shot to 70 grain equivalent (about 1 oz. ), and maybe go up in size to #5. The heavier shot has a bit more energy at the target, and for our large Kentucky fox squirrels, that's not a bad thing. Quail hunting around my neck of the woods is a pale imitation of what it was when I was a boy, because of the significant decline in the population, so I never go out looking for quail. If I stumble on a covey, I just shoot at them with my rabbit load, and that works, occasionally. If I were to load specifically for them, a charge of 50-60 grains of FFFg and an equal volume of #7 1/2 shot should do the job. Nothing beats an afternoon on a hot dove field with a flintlock fowler, and I look forward to each fall season. I use two types of charge for these birds, depending upon how they are flying. If they are tending to come in low and close, then I find that 60 grains of FFFg and 70 grains equivalent (1 oz.) of either # 7 1/2 or #8 shot works well. If I'm caught where the doves are flying high or far to the side, then I increase the powder to 70 grains FFFg and the shot to 90 grains equivalent (1 3/8 oz.) to increase pattern density. The extra powder compensates for the reduced velocity of the heavier shot charge, and I've found this combination to be a good one. I hunted turkeys for two years with my cylinder bore flintlock fowler, and took two birds. I've spent more time working on turkey loads than on all others combined, and still am not fully confident unless the bird is very close, under 20 yards. Because of the demand for excellent penetration and the large charges of shot used, I increase the powder to 80 grains FFFg in all my turkey loads. The same wad system works best in my cylinder bore, too. I experimented with a variety of shot loads, up to 2 1/2 oz. of #6, trying to get that strong, dense pattern necessary for head shots at these big birds. I finally settled on 1 5/8 oz. of #6 shot. This load will put an average of 8 lethal pellets in the skull and neck bones of a turkey at 25 yards, and that will do, most of the time. Either magnum or nickel plated lead shot should improve these turkey loads somewhat. These pellets deform less because of their increased hardness, and should tend to "fly" less, giving tighter patterns at all ranges. I've been doing some patterning with these two, but have reached no conclusion, thus far. Deer, turkey, rabbit, squirrel, quail and doves, all taken with the same gun, easily and well. Not a trivial thing, but no real problem for the flintlock smoothbore. It will get the job done, if you will do the work required to get to know it well. 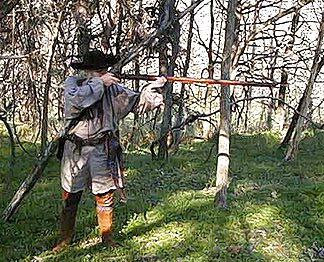 For me, there is an easy answer to the question of what gun I would choose if I could have only one... a flintlock smoothbore.